Student Voice Matters, and the Time is Now! We are directly in the middle of our 7 month campaign to ensure that the voices of the student are heard, valued, and reflected in District accountability & funding plans. 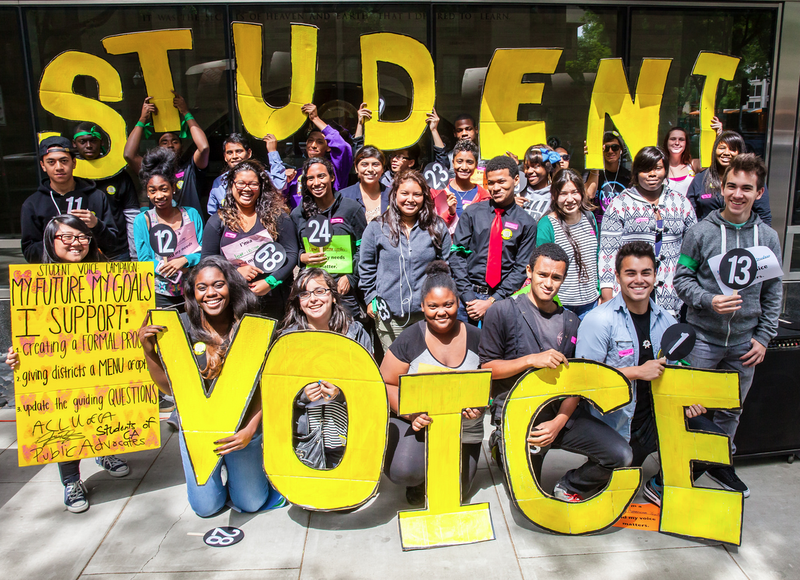 CFJ and the Student Voice Coalition have called on the State Board of Education to define student consultation by creating a formal process, giving districts a menu of options, and update the guiding questions. During the month of May, youth across the State held delegation meetings with local and state Board Members to tell their stories and express how critical Student Voice is to their success. 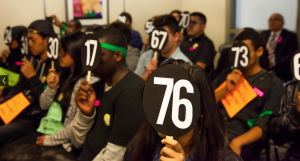 May 8th 2014 Over 50 students and allies across California came together to show that Student Voice Matters through moving public testimonies and a “faceless students” demonstration inside of the State Board of Education meeting. Students wore numbered masks to show that they are not just a number or statistic, they are students with meaningful voices! Jalisa Sanders, a Long Beach youth leader who testified at her local School Board Meeting said “Teachers have the Teachers Union, parents have parent advisory councils, but we students have a limited to almost non-existent voice in money that impacts our future. Us students want more meaningful student engagement in LCFF and we want to continue working with the State School Board to provide best practices to ensure students have a meaningful role in giving input on the LCAPs”. Jalisa and her peers should not have to fight to be heard! Stay tuned for updates around our upcoming action. We are mobilizing youth and parents from around the state for the July 10th State Board of Education meeting in Sacramento. This will be a critical moment in the Student Voice Campaign to show State Board Members that students need a formal process to engage in local budget decisions.